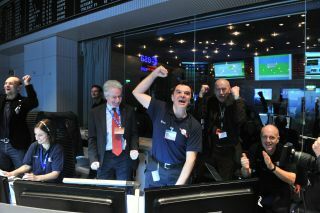 Rosetta mission scientists cheer as the comet-chasing probe's first signal after awaking from a 2.5-year sleep is received at the European Space Agency's Space Operations Center in Darmstadt, Germany on Jan. 20, 2014. A European probe awoke from a deep sleep Monday (Jan. 20) to gear up for an unprecedented comet rendezvous and landing this year that will cap a 10-year voyage across the solar system. After two and a half years in hibernation, the European Space Agency's Rosetta spacecraft emerged from its slumber while cruising nearly 418 million miles (673 million kilometers) from the sun. The wakeup call, which was due to begin at 5 a.m. EST (1000 GMT), took hours as Rosetta switched on heaters to warm itself after its long night in the cold depths of space. The first signal from Rosetta was received by NASA's Deep Space Network at 1:18 p.m. EST (1818 GMT) and relayed to ESA's Space Operations Center in Darmstadt, Germany, which erupted in cheers and applause as the signal was confirmed. Rosetta's first message home via Twitter: "Hello, world!" The signal came after 18 minutes of tense silence as Rosetta's mission team awaited word from the spacecraft. "We have our comet-chaser back," said Alvaro Giménez, ESA's Director of Science and Robotic Exploration, in a statement. "With Rosetta, we will take comet exploration to a new level." The wake-up signal from the European Space Agency's Rosetta spacecraft can be seen in this photo from ESA's Spacecraft Operations Center in Darmstadt, Germany on Jan. 20, 2014. Rosetta awoke from a 31-month slumber to prepare for its arrival at a comet later this year. "This was one alarm clock not to hit snooze on, and after a tense day we are absolutely delighted to have our spacecraft awake and back online," Rosetta mission manager Fred Jansen said in a statement. ESA officials also held a public "Wake Up, Rosetta!" video contest to encourage the public to get involved with the mission. Once Rosetta shakes the sleep out of its eyes, the solar-powered spacecraft will begin final preparations to rendezvous with its target — Comet 67P/Churyumov-Gerasimenko — in May, and then enter orbit around the icy body in August. If all goes well, Rosetta will release a piggyback probe toland on the comet in November. "We shall be on and around the comet to see how it is 'living' for more than one year, " ESA Director General Jean-Jacques Dordain said during a live webcast Monday. "It's risky, because nobody has done that before, but this is the price to pay to learn about the origin of the solar system and perhaps more of the origin of life." From orbit, Rosetta will start scouting out potential places on 67P/Churyumov-Gerasimenko's surface to deliver a 220-lb (100 kilograms) lander named Philae. A final site is expected to be chosen in October, and the touchdown will follow a month later, ESA officials say. When the time comes, Philae will be ejected from the Rosetta mothership and spiral down toward the 2.4-mile-wide (3.9 km) comet's core. When it reaches the surface, Philae will fire a harpoon to anchor itself and counter the rebounding force of its touchdown. This image shows the 4-kilometer wide Comet 67P/Churyumov–Gerasimenko - the target of the Rosetta spacecraft - as it appeared on Oct. 5, 2013 to the Very Large Telescope at the European Southern Observatory in Chile. No probe has ever landed on a comet before, so success is far from assured. But if all goes well, Philae will study 67P/Churyumov-Gerasimenko up close with its 10 science instruments, using a drill to snag samples up to 8 inches (20 centimeters) beneath the comet's surface. "All other comet missions have been flybys, capturing fleeting moments in the life of these icy treasure chests," said Matt Taylor, ESA's Rosetta project scientist. “With Rosetta, we will track the evolution of a comet on a daily basis and for over a year, giving us a unique insight into a comet’s behavior and ultimately helping us to decipher their role in the formation of the solar system." Philae should also return some otherworldly views of Comet 67P/Churyumov-Gerasimenko, which is currently in a sun-approaching phase of its 6.45-year-long orbit, researchers said. "On the lander, there's a camera that can look straight down like you’re standing up and looking at the ground. Then there's a panoramic camera that can look out and see a picture of the horizon," mission co-investigator Michael Combi of the University of Michigan said in a statement. "It’ll be fun to see what this landscape looks like. It’ll be like standing on a comet." Meanwhile, the Rosetta orbiter will be studying the comet from above with its 11 science instruments. The orbiter and lander will continue their observations through December 2015, yielding a detailed look at 67P/Churyumov-Gerasimenko's structure and composition, and how the icy object changes as it moves around the sun. NASA has contributed three of the science instruments riding on Rosetta, as well as components of others, with several U.S. researchers participating on the mission's science team. "We are going to be in the cometary catbird seat on this one," NASA's Rosetta project scientist Claudia Alexander at the agency's Jet Propulsion Laboratory in Pasadena, Calif., said in a statement. "To have an extended presence in the neighborhood of a comet as it goes through so many changes should change our perspective on what it is to be a comet." Rosetta's journey to 67P/Churyumov-Gerasimenko has been long and circuitous. The spacecraft blasted off in March 2004 and has completed four speed-boosting planetary flybys, three of Earth and one of Mars. Rosetta also flew by and imaged two asteroids — 2867 Steins in September 2008 and 21 Lutetia in July 2010 — before entering hibernation mode in June 2011, when it neared the orbit of Jupiter, the coldest and most distant part of its path around the sun.